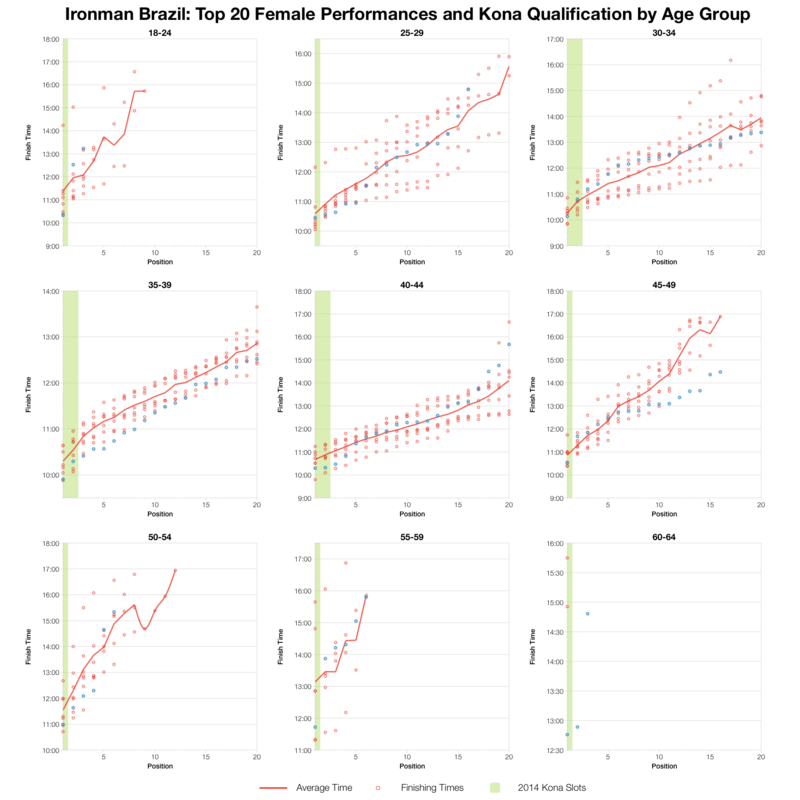 Results from Ironman Brazil have proved rather elusive – the tracker was working when I check in on race day, but when I came to retrieve them on Monday all the times had vanished. 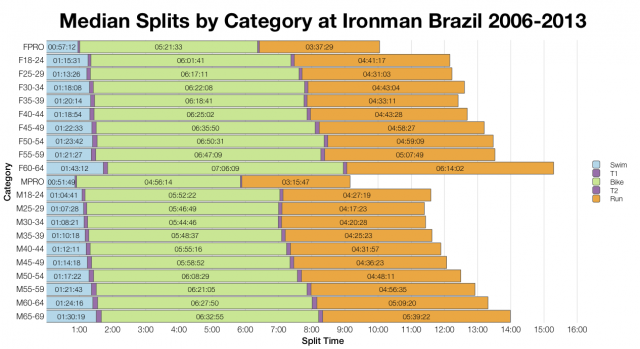 Fortunately a set of results is now up on the Ironman Brazil website, so I’ve been able to retrieve and analyse the results from the 2014 edition of the race. The quick summary is that, as we might expect, Brazil was fast; actually, if we look at qualifying times it was, if anything, faster than we might expect. Starting from the top, if we compare the median splits for each division between this year’s race and some of the previous events we can see that, for the most part, 2014 was the faster year. 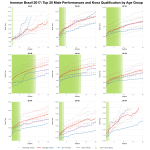 While swim splits in the age group ranks are a little slower, bike and run splits are almost exclusively faster. Checking that pattern against the professional times and we still see the faster bike split and in the case of the women’s field a faster run split too. Conditions appear to have been good for the bike and the run; the women’s pro field looks to have been particularly competitive this year as well. For a little more detail we can see how split times were distributed in the race and again compare with previous results. 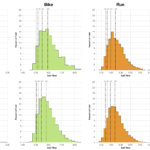 The pattern we saw with median data is again displayed: swim times skewed slower, but bike and run times are weighted more at the faster end of the field. 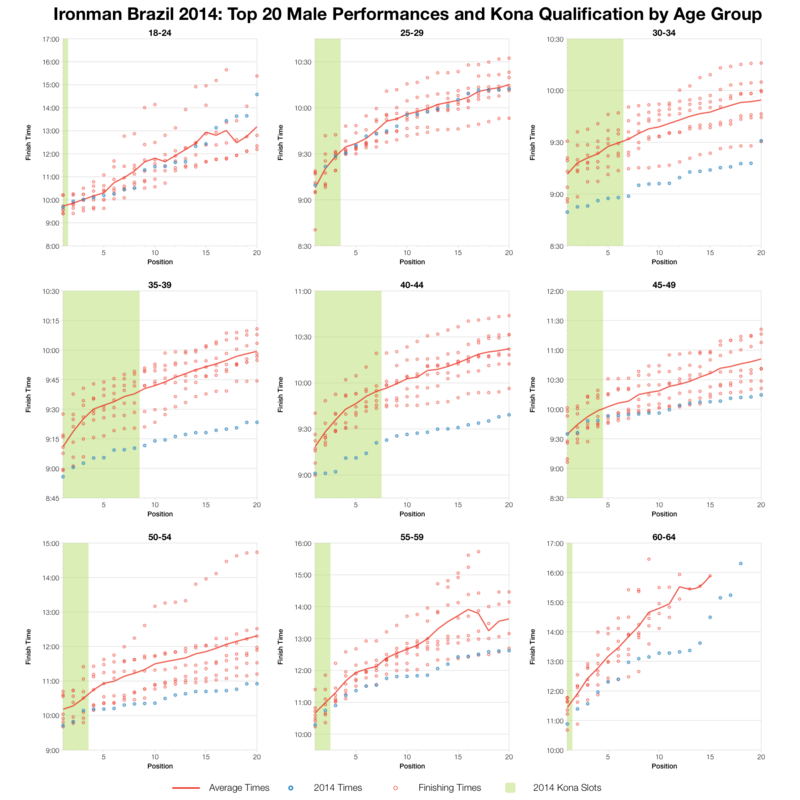 If we consider the top quarter of the field we can see that they biked under 5:20 and ran under 3:50, compared to the 5:30 and 4:00 based on previous results. The overall finish distribution naturally follows the trend. 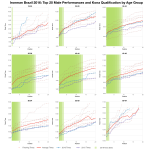 In the male age groups a lot of fast times were set by the top twenty: from 30 through to 44 we see the fastest times in the last 8 years of racing, above that they may not always be the fastest, but they are among them. With such a high number of fast athletes it’s no surprise the medians and distributions also shifted so much. 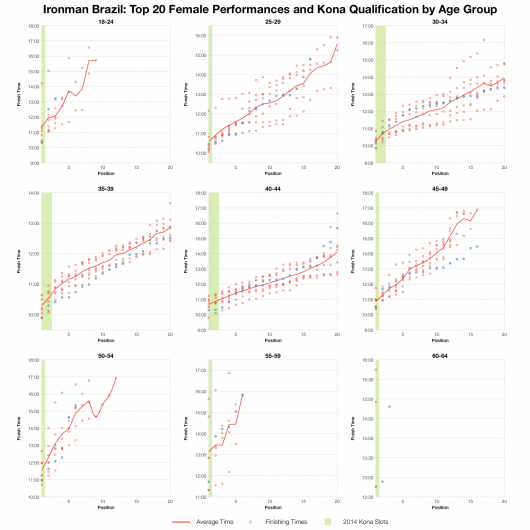 While the men had a particularly impressive day, the much smaller women’s field (150 finisher to 1491 male finishers) largely performed on par for Ironman Brazil, the 35-39 age group being the only one to consistently trend faster. Conditions were clearly favourable as improvements in splits were consistent through the field, but once again we also appear to have a step-up in performance from the front-of-pack athletes. More signs of the growing separation of those who race to compete and those who are there to complete? Not that this problem is in any way unique to Ironman Brazil. DQ rates are largely unpublished and there’s no way to measure the amount of drafting from the results, but if reports are to be believed, it’s a problem at many (if not most) Ironman events. 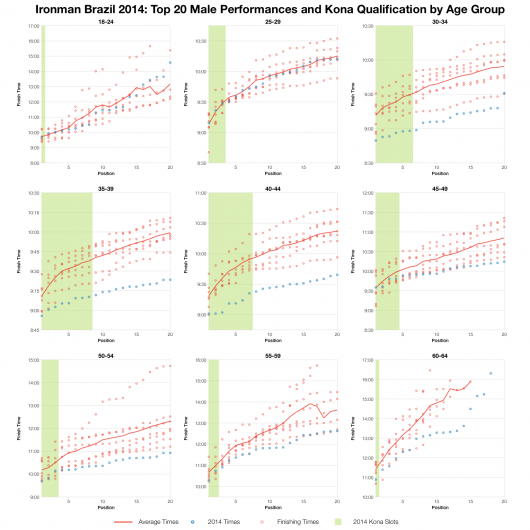 Competitor numbers are growing, the gap between the fastest age groupers is probably narrowing (I suspect, no stats for that one), the consequence is more crowding or bunching on the course. Packs may well be more likely to form, perhaps inevitably now, but there seems little willingness for an athlete to drop back. Perhaps the logic is that in a bunch like that why should it be me, or perhaps it’s the knowledge that the chances of being caught are small. Either way it’s an issue that is likely having an impact on the shape of the Kona qualifying race. Unfortunately, again, I don’t have good stats for that. Or a solution for the problem come to that. 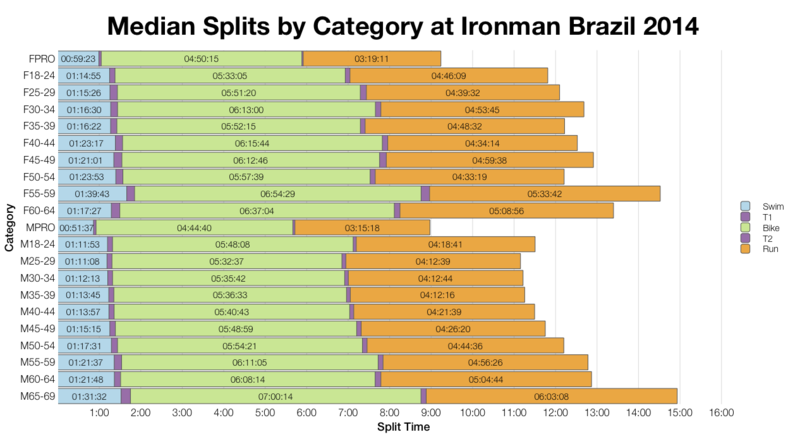 Full results are currently available on the Ironman Brazil website. I’ve also produced a PDF of this year’s top 10 in each age group along with previous years and some summary statistics from this below.